With six Fortune 500 companies headquartered in Charlotte including Bank of America, Lowe’s and Duke Energy, the city is home to the NFL’s Carolina Panthers, the NBA’s Charlotte Hornets, the NASCAR Hall of Fame and the U.S. National Whitewater Center, an official Olympic Training Center. 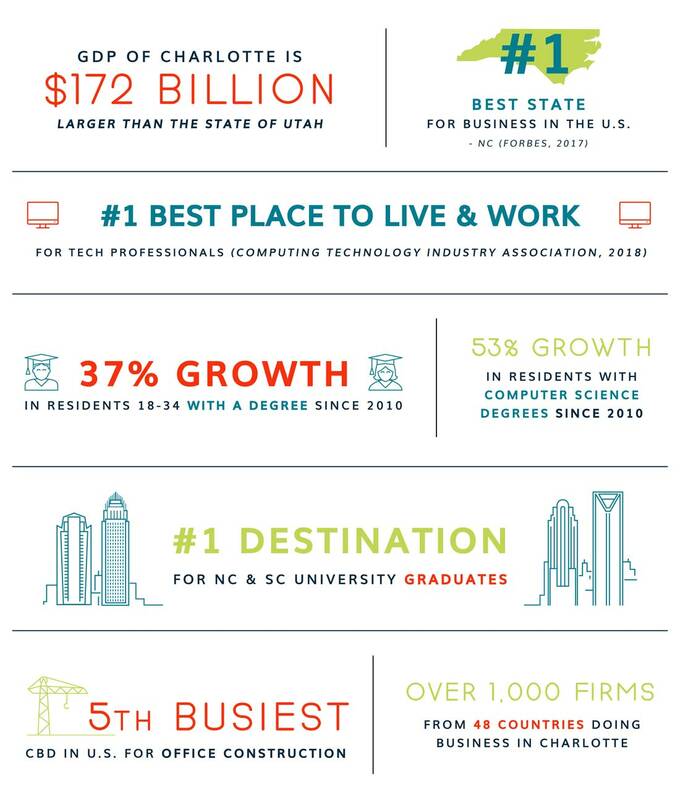 Other amenities that make Charlotte a great place to live and work include numerous institutions of higher learning, cultural offerings and healthcare facilities. 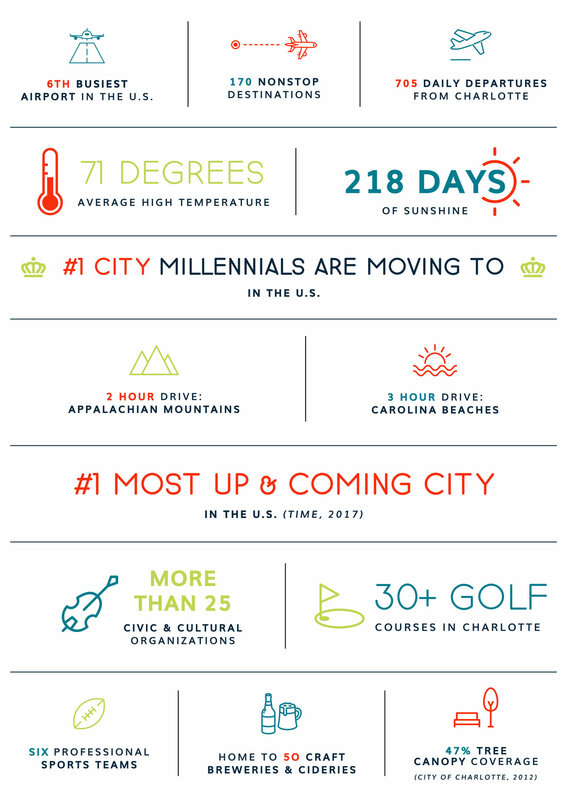 Charlotte has also emerged as a major player in the global marketplace with 14% of residents born outside of the United States. 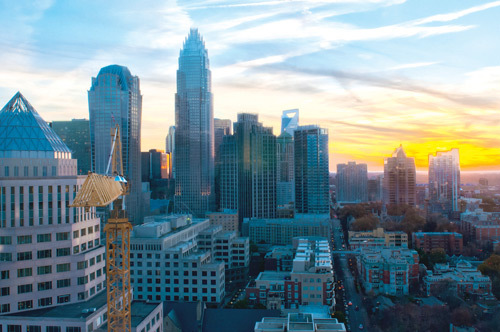 International companies play a significant role in linking it to the world economy with more than 1,000 firms from 45 different countries doing business in Charlotte. Charlotte’s Central Business District, known as Uptown, lies at the city’s geographic heart. Defined by the area located within the I-77/I-277 freeway loop, the historic intersection at Trade and Tryon Streets subdivides Uptown into distinct wards – First, Second, Third and Fourth Wards. Uptown today is a bustling 18-hour area, where people from all walks of life from across the region enjoy theatre and museums, bars and restaurants, and sporting events. Keeping up with the progress of construction has become a popular hobby, with numerous cranes consistently visible in the skyline. As land values have risen, this building boom has expanded beyond Uptown as developers have sought and found new fertile ground just outside the I-277 freeway loop and along the Blue Line rail and Gold Line rail transit corridors.